2. in the 5e/d20 version of TSL with no classes, how do you handle sneak attack? How many sneak dice do you get when you pick sneak attack? And similar? Last time I looked, it was still in the playtest phase. I'm afraid I've become too busy to follow this as much as I would like to. TSL 1st to 5th edition has been out for decades. The recent kickstarter, nope, still in the making. Talislanta The Savage Land for 5e d20 came out in PDF early April this year and that's what I have, and have had since then. I also pledged for the book and that hasn't happened yet — I guess we're waiting for the d6 version. (The orig tal rules are also out). 1. Stock them with whatever you need for your game! Just remember that part of the intent of TSL is that there are no real permanent habitations. So dungeons and ruins can be filled with anything from monsters to other tribespeople trying to find shelter for a bit. 2. That... I don't know. 3. Distances are intentionally vague. I /think/ there might be something in there about how long it takes to travel, but I don't recall (i didn't handle the mechanics chapters anyway). Distances are vague to give GMs and Players room to make additions or deletions from the map as presented. Too, there should be some ambiguity about exactly how big the Savage Land actually is because it is both the center of the continent of Talislanta AND potentially the majority of the continent of Altarus. Simultaneously. Most tribes are more concerned about daily survival than they are about recording detailed and accurate maps. And yes, it would be helpful to know how many days travel it is to the next source of clean water (etc) but part of the danger of TSL is the uncertainty - the Gyre twists and alters things as it passes and that's before you consider rival tribes taking as much water (or game) as they can or just flat out poisoning wells to deny others their use. 3. Detailed geography can be abstracted/random but for things like "how far is it between the lands"... like is it two days of travel or two years? I tried looking at some older editon Tal maps but couldn't grok them. I can just decide something, I guess. That the lands are 192 miles across or w/e. If you've got one of the old Tal maps (like this one - http://www.johnmsteele.com/wp-content/u ... taMapL.jpg which is for 'modern Tal') you can see where the TSL fits in ... sort of. Basically, the Wilderlands of Zaran and the Golarin Plains. The Dead River Chasm is still present in TSL and the Volcanic Hills in the East - those basically make the west and east landmark for TSL. The southern jungles and the forest of Tamaranth mark the south and north borders of a sort. BUT, on that map, an inch is 150 miles (240ish km). Which is really really small. Maybe 750 miles/1200km (ish) from either side. That's tiny. Personally, I've always boosted that old Tal map milage by a factor of 10 (minimum). When we were writing TSL, I suggested a measurement system based on encounters. Like, if you're crossing the Black Desert, you're going to have a minimum of X+2 encounters (vs the Southern Grasslands giving you X encounters). Those encounters didn't have to be combats, per se, but they were encounters with something. While part of that was (sort of, not really) folded into the Survival rating/difficulty for each region, it didn't really make the cut. The idea would have gone something like - you're in the grasslands, and you want to get to the old ruins you once heard about in the far north-east, you know that it will take you quite some time to get there (walking speed and all) and you're likely to have (X + X+2 + X+1) encounters along the way, so plan for that many instances. The Players could then guess that maybe half of those 3X+3 encounters would be combat and that they'd need to plan for that many fights, preparing and bartering for healing herbs, food, and water along the way. It was a bit too cumbersome however (as you can tell). So the E-W width of The Volcanic Hills, for instance, which matches up with approx one inch on that old (beautiful) map, is about 150×10=1500 miles? I.e. it'd take around half a year to cross. Around sixty-tree 24-mile-hexes (and about the length of the US East Coast according to some rando I found by searching for 1500 miles). If that's what you want then we'll do that. I noticed the different Survival ratings, that was awesome. When we were writing TSL, I suggested a measurement system based on encounters. that's not really how we think. Ages back, I ran a Tal game for 2 of my friends in college (aside: we had this thing called Interim, which was the month of January. You basically took one class for the whole month to 'broaden your horizons' but really everyone took something semi easy or related to their major). Anyways, one Interim, they wanted a break from their normal game and I ran Tal. One picked a Mandalan Mystic-Warrior and the other picked a Kang Warrior. We played maybe 3 or 4 nights a week for 4 to 6 hours a night. After the first week, the two were working together against the Quan. By the mid of the second week, both players were skipping lunch (they had a morning class, I had an afternoon one) to spend time in the library. By the end of the second week, they'd each put in more hours in the library and with history professors than for their own Interim classes, researching guerrilla warfare and various small fights for independence (including the Viet Nam war). By the middle of the third week, the game had suddenly shifted to this detailed rebellion, establishing hidden underground tunnels running through the southern Quan into the Chana jungles, with sponsored bands of rebels and guerrillas striking against hard Quan targets (including Kang outposts). So yeah, I get nerdy groups. And yeah, I like my Tal to be HUGE and spread out. Of course, I also tend to have groups with windships or other means of travel (picaresque stories, ftw!) Mainly because I like to shove in a variety of lost ruins and ancient empires and all that jazz. Too, scattered small settlements, bands of sub-men (or even half-men from back in 1st/2nd ed). Also, that 1500 mile measurement would be for the widest point of the Volcanic Hills. There's also a fabled route through the Hills, and a much narrower crossing (the Bridge at Hadran) that leads into the Quan Empire over a huge ravine. But! 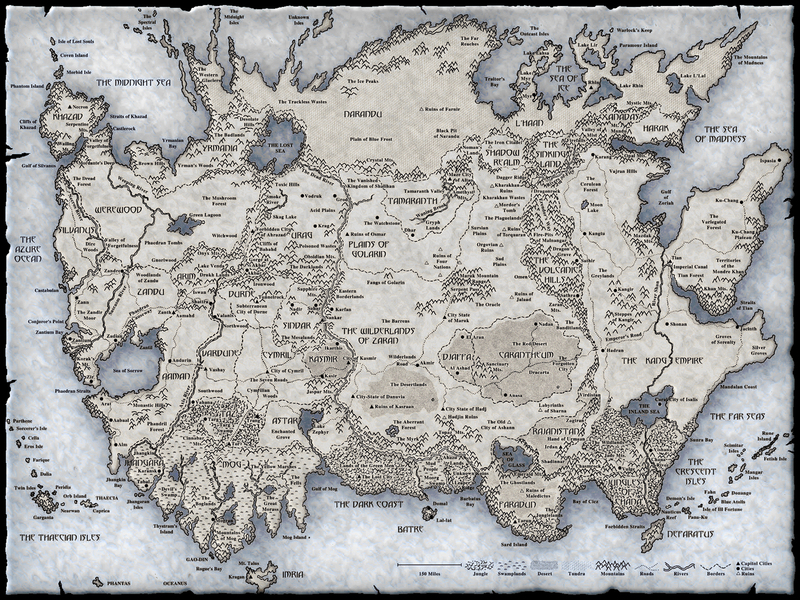 The point isn't to make the map 10x as big; the point is to find a size of the map that works for the stories you want to tell and the games you want to play. And you have to keep it internally consistent, too (don't want to change it in the middle of a game if there's already certain assumptions made about the size). Since I tend to play games where the players are traveling, traveling fast, and going from place to place, I like the extra distance because it gives me room to fit my stories in. If, in contrast, your group is on foot and dealing with things on a day by day, mile(s) by mile(s) basis, that leads to a different kind of story with perhaps a more compact map. One of the things about Tal is that part of the design aesthetic is to leave a fair bit open for GMs and groups to fill in their own blanks. There are mysteries, some of them are answered, but some of them are open to be discovered. For the old Tal map, that did not include scale, but for TSL the scale of the map is part of the mystery (for good or ill).